New Police Chief Simon Sirro. 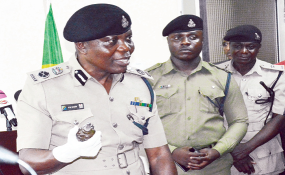 Dar es Salaam — The new Inspector General of Police, Mr Simon Siro, will tour Rufiji and Kibiti districts, areas that have been hit by a series of killings which targets local leaders and the police. Speaking to The Citizen just a day after elders urged him to visit the two district, Mr Sirro said he woud study reports from Coast Regional security and defence committee before speaking to wananchi. Apart from having discussions with the defence and security committee as well as wananchi Mr Sirro will hold talks with religious leaders. "Yes, I have received the request and I am promising the (Rufiji and Kibiti districts) I will visit them next week," Mr Sirro told The Citizen in a telephone interview. He added: "It is my belief that if wananchi will cooperate with the authorities, we will end the killings." During his first press conference, Mr Sirro declared that finding a solution to the senseless killings in Mkuranga, Kibiti and Rufiji districts will be among his top priorities. At least 31 people, including 11 police officers, have so far been killed by unknown gunmen who have issued warnings that they will continue executing leaders they accuse of harassing people and injustice. The killers have in several incidents uttered verbal warning or left notices at the crime scenes stating why they will continue with theh killings.